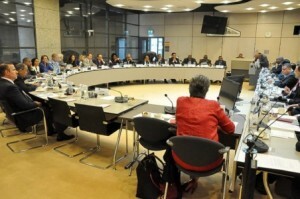 THE HAGUE - The Inter-Parliamentary Consultation for the Kingdom IPKO, a gathering of the Parliaments of the Netherlands, Aruba, Curaçao and St. Maarten, in The Hague from June 14-16 was officially announced on Thursday. The agenda includes a discussion on the future of the Kingdom. The IPKO starts next Wednesday morning with a plenary opening session in the First Chamber of the Dutch Parliament, the Senate. That meeting will be chaired by Senator Ruard Ganzevoort, Chairman of the Senate’s Permanent Committee for Kingdom Relations. On Wednesday afternoon, the delegations will meet in the Second Chamber of the Dutch Parliament in separate sessions on the subjects climate change, sustainability, youth and youngsters, education, economic opportunities within the Kingdom, health care, discrimination and integrity of government. On Thursday morning, June 15, the delegations will meet with the Members of the Island Councils of Bonaire, St. Eustatius and Saba in the Second Chamber. In the afternoon working visits will be paid to the Elemental Water Makers, the Nuon Solar Project and the Foundation Ocean Cleanup. The IPKO will end on Friday, June 16, with the approval and signing of the agreement list, and a joint press conference of the Chairpersons of the four delegations at the Second Chamber. The meetings are public and can be viewed via the live-stream on the websites of the Second Chamber and the First Chamber, depending on the venue of the meeting.